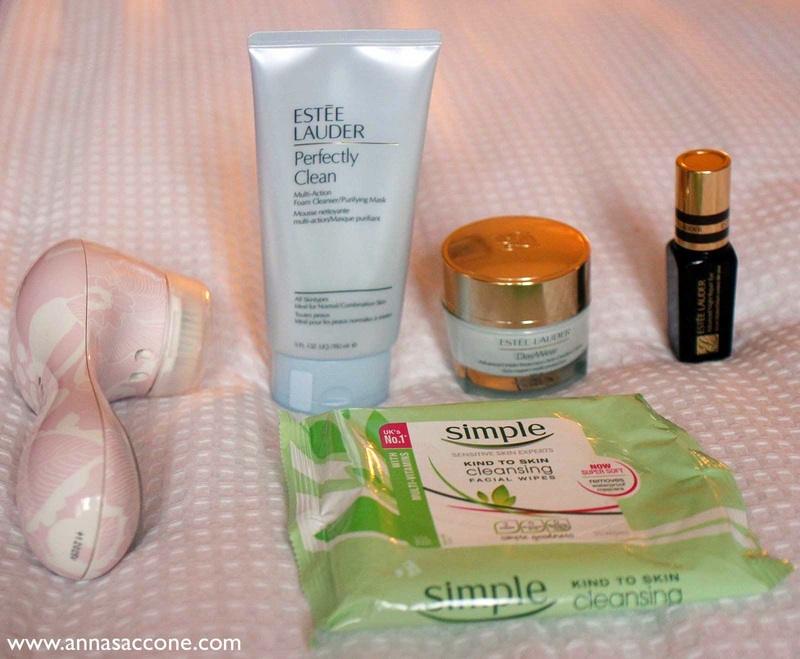 Beauty Tuesday: My Skincare Routine! These are the products I use everyday in my skincare routine. My skin type is oily/combination as well as acne prone since my teens, although it has changed over time both due to age & also with pregnancy! Throughout my teenage years I got acne pretty bad on my T-zone (in particular the forehead area - that was the worst). Eventually the products that cleared it up were the Mary Kay Velocity range as well as benzoyl peroxide for spot treatment. Almost 3 years ago around the time before my wedding I broke out pretty badly due to stress. There was literally NOTHING I could do about my skin - it was so bad. I had lots of tiny lumps all over my forehead and no matter what I used I couldn't seem to get rid of them. :( Thankfully after the wedding, it cleared up again. 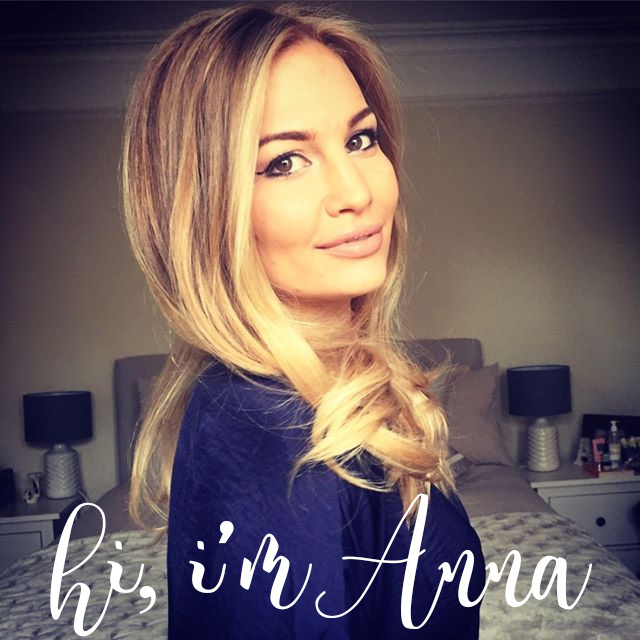 During my first pregnancy I broke out mostly around my jaw and chin area whereas my forehead & T-zone remained clear for the most part (typical of hormonal acne). This has been the same in this pregnancy as well! However I don't use any harsh acne targeting products during pregnancy as they aren't supposed to be 100% safe. So no salicylic acid or benzoyl peroxide for me at the moment I'm afraid! I use Estée Lauder Perfectly Clean Multi-Action Foam Cleanser both morning & night. This is quite expensive but you get a lot of bang for your buck as this 150ml tube lasts a very long time! I use it on my face in the shower each morning and with my Clarisonic Plus (I got mine in Pink Floral!) every night after taking off my makeup. This ensures that I get rid of every scrap of dirt, residue & makeup from the day. I thoroughly recommend the Clarisonic - I genuinely believe it has changed my life! Almost as soon as I started using it, friends & people that are close to me would comment on how my complexion looked brighter, fresher & more clear. It's definitely not a total miracle-worker in that I still do get the odd hormonal breakout but I will say that if you catch them early on (when you can feel a spot underneath your skin) and if you zap it with the Clarisonic really well the night before, you can actually prevent them from surfacing. Other than that I just love the way it makes my skin feel after using it! It looks & feels squeaky clean and I can go to bed knowing that my face has been properly cleansed. I use these two morning & night. After I turned 26 I went looking for a good eye cream and the lady at the Estée Lauder counter recommended to me the Advanced Night Repair Eye Serum. Because I'm still in my 20's and only really looking for a preventative against the first signs of ageing, this suits my skin better than a heavy eye cream. It's a lightweight serum which comes in both a pump bottle & a little tub but I prefer this packaging as one pump is all you need for both eyes. It is expensive but you go through tiny amounts everyday so again I feel that it's worth it! I purchased my first bottle in December and still haven't had to buy a new one. 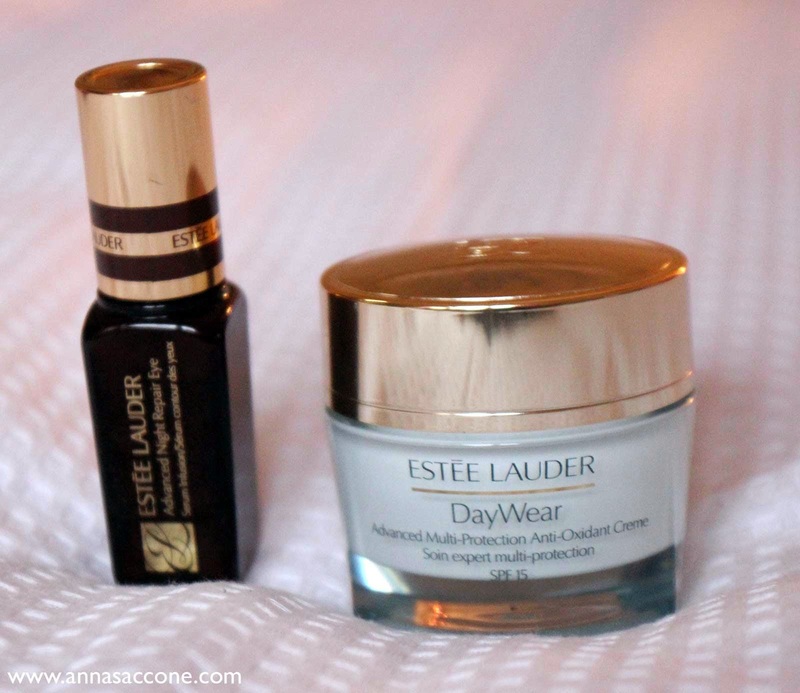 For my moisturiser I use Estée Lauder DayWear for normal/combination skin. This feels so light & cooling on my skin - I love it! It also has SPF 15 in it. 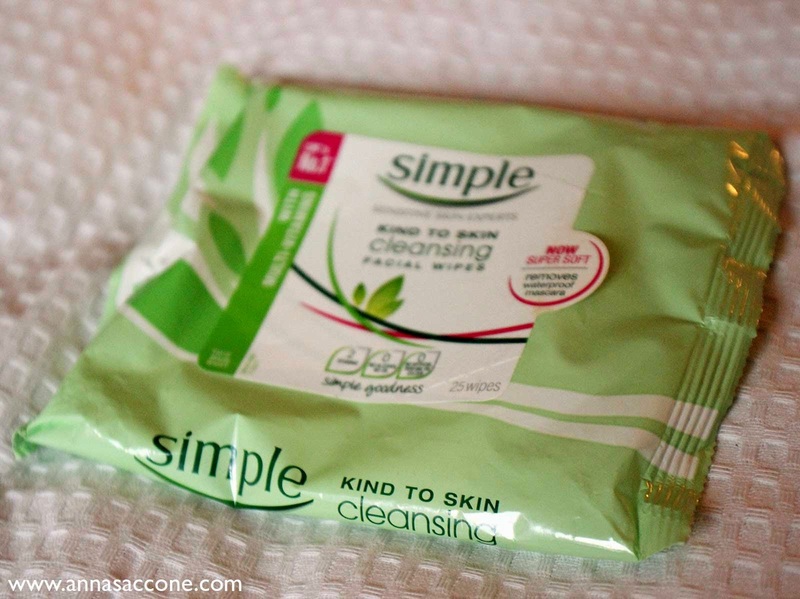 Last but not least, I remove my makeup every night using these Simple Kind to Skin Cleansing Facial Wipes. Makeup removing wipes get a pretty bad rep as they all have some amount of alcohol in them and are often seen as the "lazy option" when it comes to taking off your makeup. However these Simple ones have always worked so well for me! They never break me out, they stay damp (especially if you store them upside down) and get rid of even the toughest eye makeup. I use one wipe only for both my eyes & whole face. Obviously, you do not want to use these on their own to take off your makeup & cleanse your face at night. 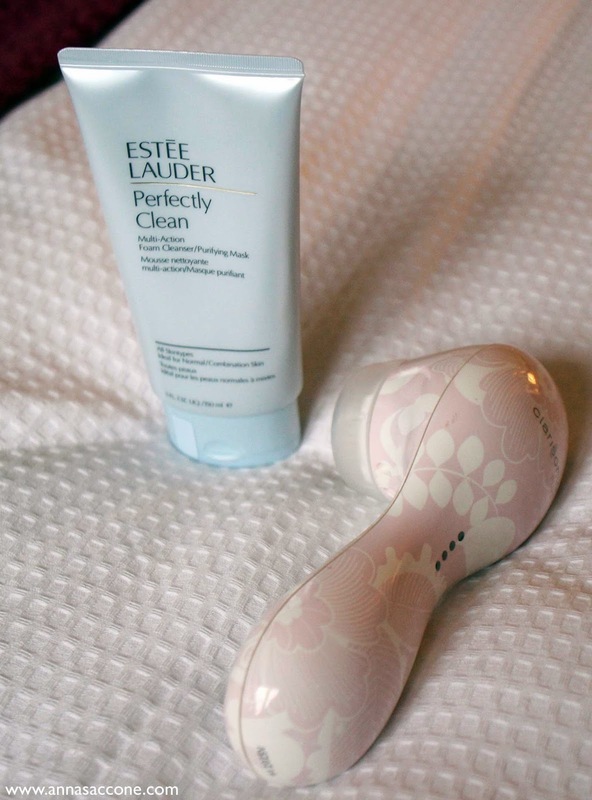 It's really important to cleanse properly afterwards...which is why I use my EL Perfectly Clean & the Clarisonic. I think if you do this, there's no problem with using wipes to remove your makeup. I just wouldn't use them on their own! As I mentioned previously, I don't use any acne treatments on my face while pregnant. However I do recommend PanOxyl if you are not pregnant as that is the only thing that worked for me to clear my acne! It comes in a little tube like toothpaste, you can get it at some pharmacies or online (you don't need a prescription). I use level 5 (5% benzoyl peroxide) and you need a tiny amount applied only to the spot where you're breaking out, no more than once a day. This stuff does dry out the skin so be sure to use a good moisturiser afterwards! That's my current skincare routine - I hope this post was helpful! 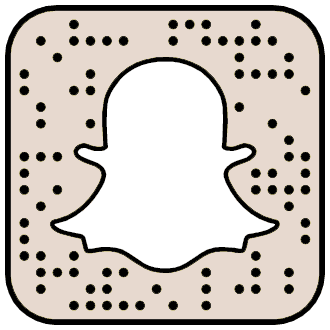 If you have any questions, feel free to leave them below. Otherwise you can check out my skincare routine video here! Anna its been a while since you have updated us on this, you said you don't use wipes anymore, what do you use??? ?